Hormel Foods has understood that for more than a century. The company even employs professional chefs to serve as matchmakers, bringing the most delectable and irresistible products, recipes and meal ideas to those in search of true love. Their jobs range from developing the products that find their way into our kitchens to teaching us how to make them shine for our family and friends, and the list goes on. We recently met with members of the band of Hormel Foods chefs to learn more about what they do for love. Chefs Thomas Dickhans and Chris Candullo have a weighty responsibility. They are two of the culinarians who play a major role in developing the dishes that millions of Hormel Foods customers and consumers reach for every day. Chris has been with Hormel Foods for a decade. Thomas, who serves as the development leader, has been in the fold for 30 years. He came to the United States from his native Germany, where he completed a culinary apprenticeship and began working in a hotel restaurant. He eventually joined Hyatt Hotels and emigrated to the United States. He already had the cooking part down pat; the language barrier was another issue altogether. He perfected his English by watching the children’s program “Sesame Street” and “Love Boat,” a popular television show that ran from the late ‘70s through 1987. These days, he is not only fluent, he has mastered the complexity of being humorous in a non-native language. “I do a lot of laughing,” Chris says, referring to his partnership with Thomas, his boss and current mentor. But make no mistake. Chris gives as well as he gets. “I’ve slaved for him,” he quips. Their jobs are far from frivolous, but they are nevertheless fun. Thomas admits to sending emails out late at night when he has a spark or some information that might be useful. It’s all part of the process that doesn’t stop when the development team of approximately 20 chefs, scientists and servers leaves the property. Both chefs talk about their jobs as puzzles that must be worked and even as an old-fashioned switchboard with plugs that go in and out continuously. Neither does the company require them to do so, a quality that fosters creativity and problem solving. But not all was smooth sailing. For example, the chefs discovered an ingenious smoker smaller than a conference table and ordered it from a vendor in Scotland. “The first time we tried it, we smoked out the whole building,” Thomas says. Development at Hormel Foods is an art. Our value is in the center, between the absolute chef and the absolute scientist. The memories of the glitch are as vivid today as ever. But because no harm was done, the pair can laugh about it. In addition, Hormel® Fire Braised™ meats have been a shining example of what Hormel Foods and this development team do so well. “The fun was to develop something new and get the idea sold to marketing,” Thomas says, adding that Hormel Foods has sold more than 10 million pounds of the product so far. Not every project works that way, however. Each product is special and distinct. There is no cookie-cutter approach. “Development at Hormel Foods is an art. Our value is in the center, between the absolute chef and the absolute scientist,” Chris says. It’s not an ordinary undertaking for a food company, they insist. 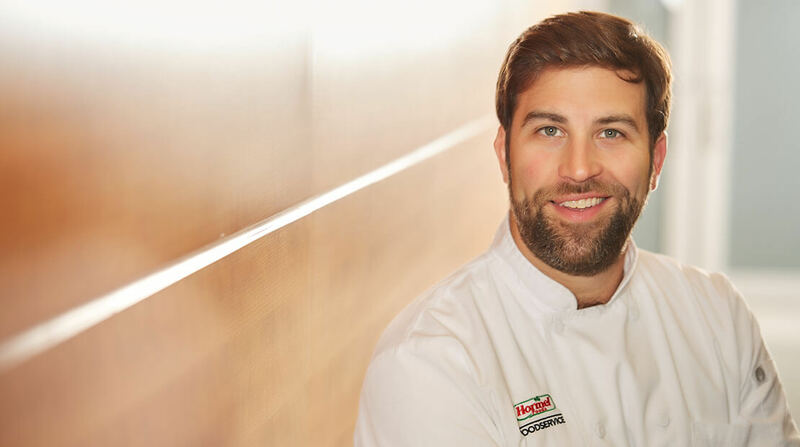 One day last summer, a legion of corporate chefs from Marriott Worldwide came to Austin, Minnesota, to see – and taste – new offerings from Hormel Foods. Chef Tony Finnestad was at the ready, presenting six courses in an hour’s time. 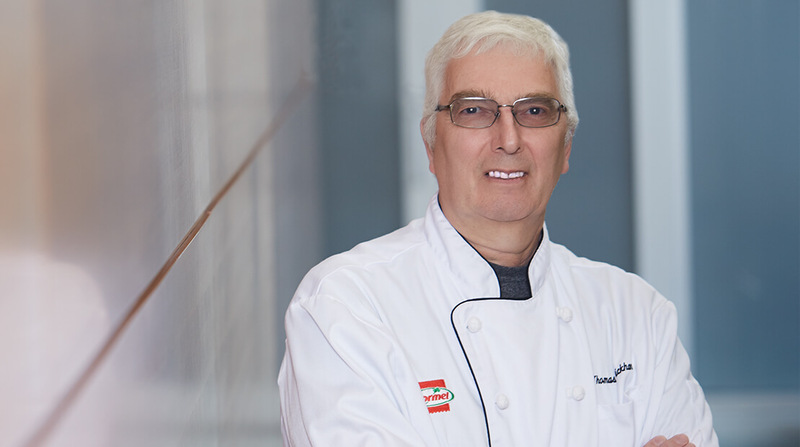 As the corporate chef for the foodservice group, he supports the chain businesses in particular, showcasing ingredients they may not have thought of or even known about. “There’s no such thing as a typical day,” he says. “My role here is fantastic,” he says, not missing for a minute the adrenalin rush of being in a restaurant kitchen night after night. His new job holds its own brand of excitement. 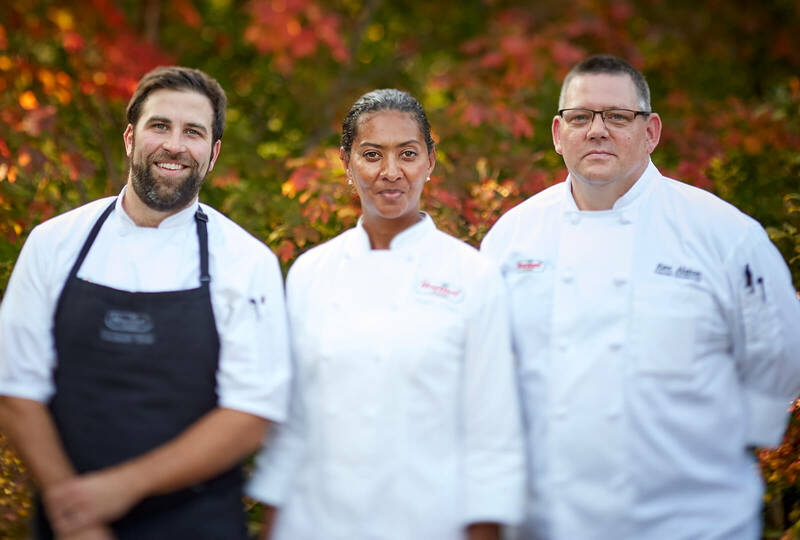 The years that followed were filled with a string of successes and culinary positions of increasing responsibility throughout the United States, including the kitchen’s top spot: executive chef. A desire to move “back home” and start a family – Tony and his wife grew up in Minnesota –nudged him toward Hormel Foods. They are now the parents of an 8-month-old daughter. He’s reminded often of the old days. “I enjoy the people I work with immensely. 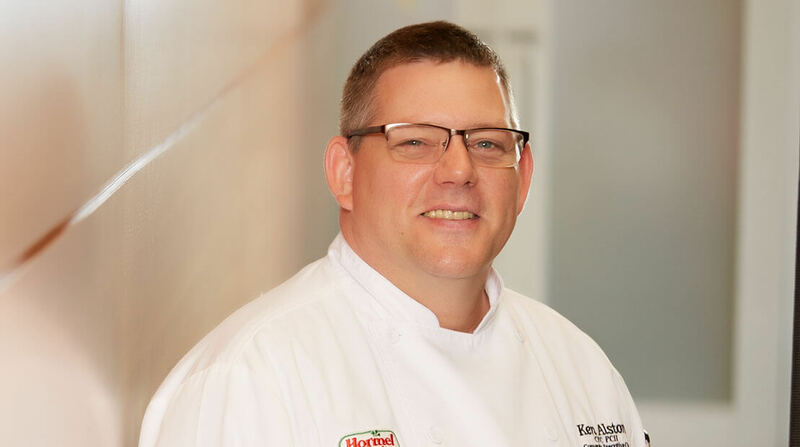 As the corporate chef overseeing a historic property that is known simply at Hormel Foods as the Sales Cabin, Ken Alston operates what he likes to call “an internal restaurant.” In 2017 alone, he and his team handled in excess of 500 events, ranging from small gatherings of a dozen or so people to board meetings, hog roasts and retirement dinners of more than 100 attendees, a time-honored company tradition. Ken, who served with the U.S. Navy, sat down with Tony to come up with a plan for an event that would support military veterans. “We wanted to see grand things,” Ken says. Like the company he works for, he is open about his dedication to veterans of the armed forces. Ken can trace his family’s military service back to the U.S. Civil War and even the American Revolution. His father was a World War II veteran who was later confined to a wheelchair. That made it necessary for Ken and his sisters to pitch in and help with the household chores, including lending a hand with the cooking. He liked it well enough that when he was 16, he went after a job as a dishwasher. Thirty-five years later, Ken’s passion and inspiration are still going strong. Making food look as delicious in pictures as it does when it’s in front of you is an art form that Angela Sellers knows well. 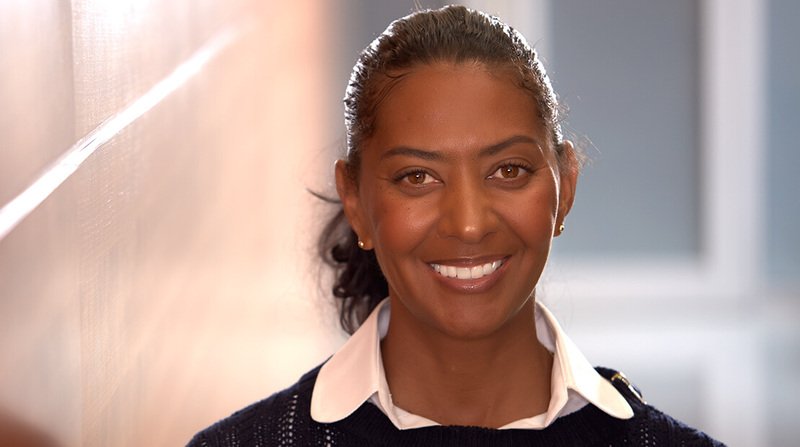 As a chef who was trained at the Culinary Institute of America, Angela worked in restaurants before securing a position with Martha Stewart as a recipe developer. She soon landed at Southern Living magazine, where she tested and developed recipes and styled food for photos for 11 years. Based in Austin, Minnesota, Angela is a member of the creative team that makes up Studio H, the in-house design studio of Hormel Foods. “I develop recipes for the various brands of Hormel Foods,” she says. In other words, the recipe suggestion on the Mary Kitchen® corned beef hash package may well have Angela’s stamp of design and approval. In addition, she probably had a hand in making it camera ready. “I’m the food stylist for about 85 percent of what’s shot in the studio,” she says. Her job puts her in the local grocery stores on a daily basis, picking up ingredients. She says it keeps her in touch with the people who are using Hormel Foods products. “It’s helpful to see if package sizes have changed, and what’s easy (and hard) to find,” she says. Given her Southern roots – Angela was born and raised in Alabama – one has to ask the weather question.